Whether these mountains are climbed or not, smaller expeditions are a step in the right direction. It’s 1938, the British have thrown everything they’ve got at Everest but they’ve still not reached the summit. War in Europe seems inevitable; the Empire is shrinking. Still reeling from failure in 1936, the British are granted one more permit by the Tibetans, one more chance to climb the mountain. Only limited resources are available, so can a small team be assembled and succeed where larger teams have failed? H.W. Tilman is the obvious choice to lead a select team made up of some of the greatest British mountaineers history has ever known, including Eric Shipton, Frank Smythe and Noel Odell. Indeed, Tilman favours this lightweight approach. He carries oxygen but doesn’t trust it or think it ethical to use it himself, and refuses to take luxuries on the expedition, although he does regret leaving a case of champagne behind for most of his time on the mountain. 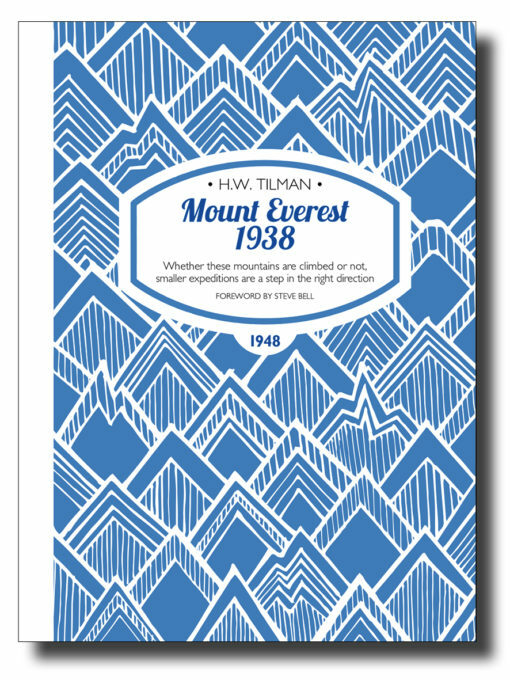 In Mount Everest 1938, first published in 1948, Tilman writes that it is difficult to give the layman much idea of the actual difficulties of the last 2,000 feet of Everest. He returns to the high camp and, in exceptional style, they try for the ridge, the route to the summit and those immense difficulties of the few remaining feet. Tilman and his contemporaries will forever be part of our mountain heritage. The lessons they learned set the stage for the first ascent of Everest, which blazed the trail that so many now follow. It is perhaps a kindness that the taciturn and ascetic Bill Tilman is no longer here to see the circus that Everest has become; his angels might weep indeed. But we must remember that whatever the future holds for the world’s highest mountain, it will never diminish the mighty endeavours of its earliest explorers. Steve Bell started climbing in 1975 and soon became one of Britain’s up-and-coming young mountaineers, making winter ascents of the Matterhorn and Eiger north faces before he was twenty-one. Following a season with the British Antarctic Survey and four years as a Royal Marines officer, he co-founded Himalayan Kingdoms, a trekking and mountaineering company. In 1993 he became the first Briton to guide clients to the summit of Everest, and in 1995 he founded Jagged Globe, one of the world’s leading mountaineering companies. He lives in Australia with his wife, artist Rossy Reeves. ISBN 978-1-909461-26-0; 216 x 156mm, 216 pages, photos, maps. Softcover with sewn binding, cover flaps and matt lamination.